The summer is a wonderful time to hit the road and explore a variety of geologically significant places. Here, we profile three stone features that have been transformed into memorials to important figures in U.S. history  Confederate generals, presidents and a Native American hero. These memorials stand as a tribute to the regions rich geologic and cultural histories. For more travels in geology, visit our Web feature at www.geotimes.org/Travels.html. Stone Mountain in Georgia is famous for the Confederate memorial carved into its north face, which features Confederate President Jefferson Davis, General Robert E. Lee and General Stonewall Jackson, each on horseback. The sculpture, completed in the early 1970s, covers three acres of exposed granite. And, though it is actually larger than the carved part of Mount Rushmore, the memorial is dwarfed by the amount of granite the sculptors left behind  7.5 billion cubic feet covering 538 acres. Located 16 miles east of Atlanta, Ga., Stone Mountain is about 540 acres of granite that rises more than 700 feet above ground. Courtesy of Stone Mountain Park. Stone Mountain is a monadnock, a remnant of resistant rock that withstood the forces of weathering and erosion that denuded the terrain around it for millions of years. From its base, it rises more than 700 feet above the surrounding 3,200 acres of Stone Mountain Park. The peak, at 1,686 feet above sea level, affords views of up to 45 miles on a clear day, including vistas of the Blue Ridge Mountains to the northwest and of Atlanta, 16 miles to the west. Likewise, the mountain is visible from miles away. You rarely find outcrops that are this large and this spectacular, says Pamela Gore, a professor of geology at Georgia Perimeter College in Clarkston, about 5 miles from Stone Mountain. The behemoth lump of granite formed when magma intruded several miles below the surface during the collision of the North American and African continents that formed the Appalachian Mountains. Although the granite cooled about 300 million years ago, the rock did not see the light of day until uplift and erosion uncovered it 15 million years ago. This uncovering is the cause of Stone mountains domed shape. As erosion removed the overlying rock burden, pressure was released and the outermost layers began to expand and fracture. The rock then peeled from the surface in concentric onion-like layers in a process called exfoliation, which continues today. The carvers of the Confederate memorial took advantage of a similar process using a tool called a thermo-jet torch (also used on parts of Crazy Horse; see page 35). This was like man-made exfoliation, Gore says. You heat it, the rock expands, and then it just pops off in chunks. It wasnt done with a hammer and chisel, but with a torch. The torches allowed carvers to remove tons of granite per day. Although the idea for the memorial was conceived of in 1915, and initial blasting and carving began in the 1920s, work on the sculpture stopped due to lack of funds and did not start up again until the mid-1960s, after the state had purchased the land. It then took six years of carving with the thermo-jet torches to complete the sculpture, which was officially dedicated in May 1970. Visitors can see the mountain up close by ascending the 1.3-mile walking trail. Along the trail, look for Civil War-era graffiti  names and dates carved into the stone by visitors who wanted to leave their mark on this ancient place. Gore says these are not only a fascinating peek at the past, but also well-dated examples with which to demonstrate the effects of weathering over time. 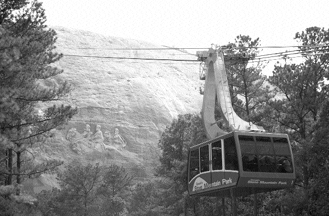 A tram takes visitors to the top of Stone Mountain in Georgia and gives them a close-up view of the memorial carved into the granite  Confederate President Jefferson Davis and generals Robert E. Lee and Stonewall Jackson, each on horseback. Courtesy of Stone Mountain Park. Near the summit, visitors can see depressions in the rock called solution pits, which were caused by the exfoliation. These small hollows fill with water and can support tiny ecosystems, including two federally protected species of aquatic plants and a species of tiny clam shrimp. For those interested in the human history of the site, the East Quarry features an outdoor exhibit center. Granite quarrying began here around the time of the Civil War and, over the next 130 years, an estimated 7.5 million cubic feet of rock were removed for use around the country. The exhibit details the process of quarrying and the technological advances made over the years, as well as how the stone was worked and used. From a massive body of granite in South Dakota came two of the worlds renowned stone memorials: Mount Rushmore and Crazy Horse. The presidential faces of Mount Rushmore National Memorial are the worlds largest busts. 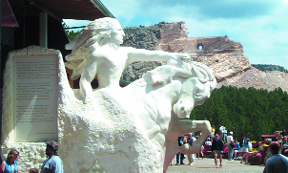 When finished, the Crazy Horse memorial to the spirit of Native Americans will be the worlds largest sculpture. Commissioned in the early- to mid-20th century, these two monuments memorialize Americas past and outline the horizon in the southwest corner of South Dakota. Mount Rushmore and Crazy Horse are both carved from the Harney Peak granite, which is named for the highest point east of the Rocky Mountains at 7,242 feet. The granite of the Harney Peak batholith was emplaced around 1.7 billion years ago at a depth of 3 to 6 miles, says Mark Fahrenbach, a geologist with the South Dakota Geological Survey. Some of the granite cooled quickly, forming finer mineral grains, and some cooled more slowly forming coarse-grained pegmatite. Both carvings exhibit a mixture of each rock texture. The Rocky Mountains began uplifting 65 million years ago and in the process uplifted the Black Hills, in which both monuments lie. As the Black Hills began to rise, the weaker sedimentary and metamorphic rocks above the granite began to crack and erode away bit by bit, leaving stunning granite outcrops and sharp spires across the landscape, Fahrenbach says. Weathering in this resilient granite is very slow  less than one-tenth of an inch per 1,000 years. But freeze-thaw fracturing poses a substantial threat to both memorials, Fahrenbach says. When water seeps into minute cracks in the granite and expands as it freezes, it further cracks the rocks. For many years, workers at both Crazy Horse and Rushmore have been filling the cracks with caulking to prevent further cracks in the monuments. Initially at Rushmore, they used a mixture of white lead, linseed oil and granite dust, but that exacerbated the problem, says Judy Olson, the assistant chief of interpretation at Mount Rushmore National Memorial. Now we use a silicone caulk, similar to what you use in your bathtub, Olson says. The caulking lasts a long time, she says, but a maintenance crew inspects the memorial each year and repairs any cracks to preserve the sites for generations to come. In 1923, Doane Robinson, the superintendent of the South Dakota historical society, decided he wanted a monument carved out of the Black Hills to attract tourists. He envisioned large carvings of legendary Western figures such as Buffalo Bill Cody, General George Armstrong Custer and Chief Red Cloud. Robinson asked Gutzon Borglum, who was carving Stone Mountain in Georgia (see page 34) at the time, to carve his monument in the Black Hills. 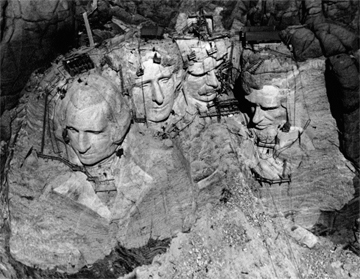 From 1927 to 1941, workers carved the four presidential faces of Mount Rushmore out of a single block of granite in the Black Hills of South Dakota. Today, each 60-foot-tall face of the memorial rises 500 feet above the surrounding landscape. Courtesy of Mount Rushmore National Memorial. In 1924, Borglum traveled to South Dakota to visit the site Robinson had chosen and promptly decided the rock was too fractured to carve, Olson says. So, he set off on horseback throughout the area and found an outcrop called Mount Rushmore, which he decided was perfect: It faced southeast, giving it direct sunlight most of the day, was surrounded by a pungent birch and aspen forest, and was composed of a solid granite mass that had few fractures and was higher than its surroundings, Fahrenbach says. Borglum accepted the commission but rejected Robinsons plan for regional heroes, Olson says, and instead chose four influential presidents to create an eternal reminder of the birth, growth, preservation and development of America. Because funds were tight and Borglum was unhappy with the Stone Mountain project, he left Georgia for South Dakota. In 1927, President Calvin Coolidge dedicated Mount Rushmore, and Borglum began construction. From the first blast until the last minute detail carved 14 years later, Borglum employed almost 400 workers, although no more than 30 to 40 at once. The workers used dynamite to carve 90 percent of the busts, Olson says, and techniques called honeycombing and bumping to finish the faces. Honeycombing involves drilling very closely spaced holes and then using chisels and hammers to break apart the rock between the holes. Bumping uses a pneumatic drill to smooth the surface of the granite. Although most of the drilling went fairly well, Borglum encountered several challenges to his vision. Visitors might note that Roosevelts face is inset more than the others, Fahrenbach says, because Borglum had to remove nearly 80 feet of ancient, severely cracked rock to reach solid granite. Borglum had also planned to carve more detail at the base of the presidents busts, but a contact between the easy-to-carve fine-grained granite and a mica schist that could not be carved runs directly underneath the busts, Fahrenbach says. Borglum died in 1941, and his son continued to work on the memorials for months after his fathers death. Due to the onset of World War II, funding was permanently frozen, and the project came to an end. By that time, the faces of presidents George Washington, Thomas Jefferson, Abraham Lincoln and Theodore Roosevelt stood 60 feet tall, 500 feet higher than the surrounding landscape (5,675 feet above sea level). And 450,000 tons of granite had been removed from the mountain during carving. Today, roughly 3 million people visit the site annually, Olson says. In addition to viewing the memorial, visitors can stop by the memorial museum and the Sculptors Studio, which houses plaster models and tools Borglum used to carve the mountain. Visitors can also stroll along the Avenue of Flags or hike the trail through the pine forests up to the base of the mountain. Just a 17-mile drive from Mount Rushmore is Crazy Horse, a monument dedicated to the spirit of Native Americans. A Lakota Indian, Crazy Horse lived during the mid-19th century and was known for his tenacity of purpose, modest life and unfailing courage in preserving the traditions and values of the Lakota way of life, according to the Crazy Horse Memorial Foundation. The development of the Crazy Horse memorial began in 1939, when Native American leaders asked a prominent American sculptor to carve a statue to embody the spirit of their people. Carving began on the statue in 1948 and continues today. Courtesy of Robb DeWall and Crazy Horse Memorial Foundation. In 1939, Native American leaders asked Boston sculptor Korczak Ziolkowski to visit the Black Hills (which were sacred to the Lakota), to build a memorial to their people. Ziolkowski found a solid granite outcrop and agreed to carve the memorial. Initially, he planned to carve the top of the mountain, but soon decided to carve the entire mountain instead. At completion, the memorial will stand 563 feet high and 641 feet long, the worlds largest sculpture. However, when the memorial will be completed is anyones guess, says Ruth Ziolkowski, the sculptors wife who worked with him on the mountain until he died in 1982 and then took over the management of the project. Several factors limit its completion, including financing (the site is funded entirely by visitors and private donations, not through the government) and, to a lesser extent, the weather; the sculptors only blast when it is warm enough that the air lines to the drills wont freeze and when there are no thunderstorms in the area, Ziolkowski says. The first blast on the mountain occurred at the memorials dedication in 1948. Over the next 34 years, the Ziolkowskis worked on the monument  Crazy Horse astride his horse, left arm outstretched pointing over the Black Hills in answer to the question, Where are your lands now? to which Crazy Horse is reputed to have replied, My lands are where my dead lie buried. The Ziolkowskis were working on clearing the rock away in front of Crazy Horses face when Korczak died; 7,400,000 tons of granite had already been removed from the mountain. The Ziolkowski family, Ruth and seven of their 10 children (and several grandchildren), continued work on the monument after Korczaks death. Work had focused on the horses face but soon began to center on Crazy Horses head and face. By 1998, his profile was completed; it stands 87 feet, 6 inches high. Crazy Horses outstretched arm is 237 feet long. And the horses head, on which work continues today, is 219 feet high. Indeed, carving Crazy Horse has been a learning experience, Ruth Ziolkowski says. In the beginning, they used dynamite but soon switched to detonating cord, which is much easier to control and better preserves the rock left after the explosion. Once the general shape of the sculpture is blasted out, the sculptors bring in a jet-finishing torch to smooth the surface. Watching the sculpting work in progress has become a popular activity for the more than 1 million people who visit Crazy Horse each year (some visitors are lucky enough to catch a blast on the mountain). The family has developed a scholarship fund for Native American students and built two Native American cultural museums onsite, where Native American artisans work and describe their craft-making and which hold traditional music and dance shows. Ultimately, the goal is to build a Native American university and a medical center onsite.